With the number of tonkatsu joints sprouting up in Manila, it’s difficult to tell these restaurants apart. Tonkatsu is tonkatsu, after all. It’s a breaded porkchop, just how many ways can you serve it? Japanese katsu chain Kimukatsu, a relatively new player in Manila’s tonkatsu wars, surprised us with their mille-feuille-style 25-layer stuffed katsu. 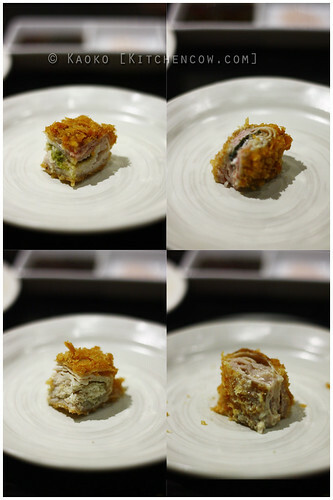 Kimukatsu’s layering style takes its cue from the French mille-feuille pastry. Instead of offering a single thick slab of katsu, their katsu comes in ultrathin layers that are stacked, breaded and fried, to create katsu that’s juicy and tender to the bite. The layers are stacked in a strategic manner to spread the fat around, spreading the flavor as well. An added bonus to Kimukatsu’s mille-feuille-style is how it can be stuffed with a variety of fillings that add a new dimension to the usual tonkatsu. 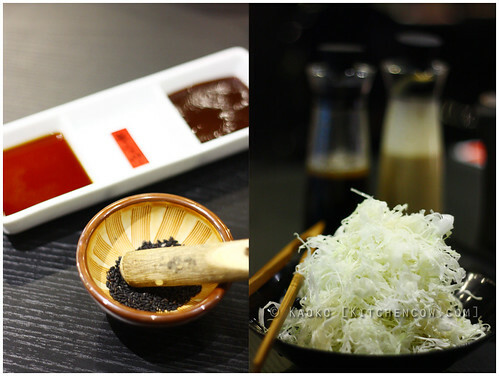 Our meal at Kimukatsu began with a mortar and pestle of black sesame seeds. Standard with katsu restaurants nowadays, right? What isn’t standard was the two kinds of katsu sauce we were told to pour the ground up seeds in. There was the usual tonkatsu sauce; Kimukatsu’s version is fruity-sweet, with strong hints of tomato. And there was a ponzu sauce for the traditional Japanese-flavored katsu. The citrusy ponzu has a distinct Japanese flavor profile, to complement the more Japanese-flavored of the katsu. 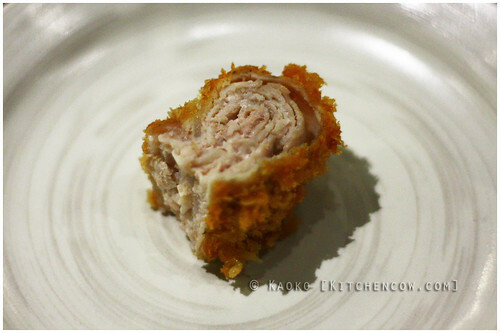 As a large serving tray of stuffed katsu was trundled out, we were amazed by the cross-section. There really were distinct layers to it. And not just ordinary layers, but paper-thin layers that I cannot imagine pulling off in the kitchen; not with my meager knife skills. 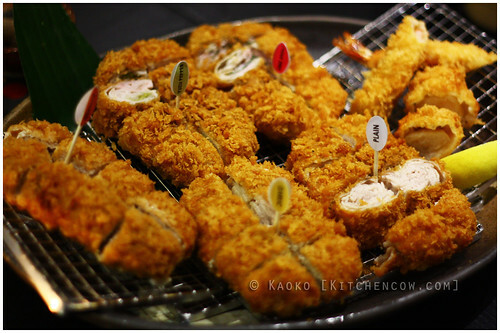 The katsu combo that we enjoyed is perfect for the typical Pinoy who loves getting a taste of everything. We love snatching food off each other’s plates. This large platter of different flavor encourages our penchant for sharing. We got to try five variants: plain, yuzu-pepper, ume-shiso, cheese and garlic. The plain highlighted the tenderness and the moistness of the pork. With no other flavorings to distract us, it was a perfect demonstration of why Kimukatsu champions their mille-feuille technique. But let’s be honest, it was the flavored ones that really had us all giddy as we were eating. And for a good reason. The cheese was creamy perfection. The garlic was extremely fragrant, reminiscent of the buttery-savory taste of cooked garlic. The yuzu-pepper was stellar, a mix of citrus and heat, reminding me of sharp jalapeños that make your eyes water while enticing your tastebuds to no end. The ume-shiso was everything it promised to be: tangy from the sour plum and refreshing from the shiso. The wonderful variety makes it more about the eating experience than just eating to fill your stomach. I know I’d have it all again in a heartbeat. Yummy potato salad and Kimutaku. The kimutaku is kimchi and takuan salad, but it really cracked me up because of Takuya Kimura, heehee. Kimukatsu has other things going for it, other than their unique stuffed katsu. Their goma dressing is very, very, very good. Rich and creamy, Pad and I agreed that it’s one of the best ever we’ve had. Their miso soup comes in two varieties: a richer red miso and a lighter white miso. Both are good, so it’s really a matter of personal preference. The rice, an authentic koshihikari, is served steaming hot in a small wooden tub. What makes it extra special is the sheen on it. Their chef, Bob Suzukawa, calls this shining rice. And it does, really. It reminded me of all those cooking-themed anime where the chef unveils a dish and it sparkles! Sugoi! 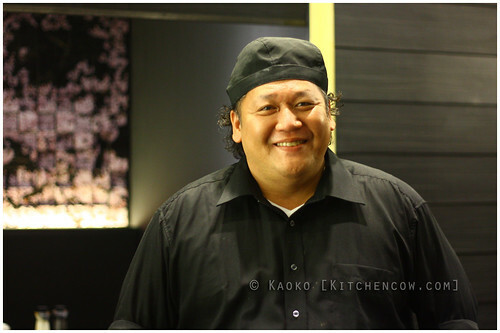 As katsu has captured the Pinoy palate, I’m sure you already have your favorite restaurants. 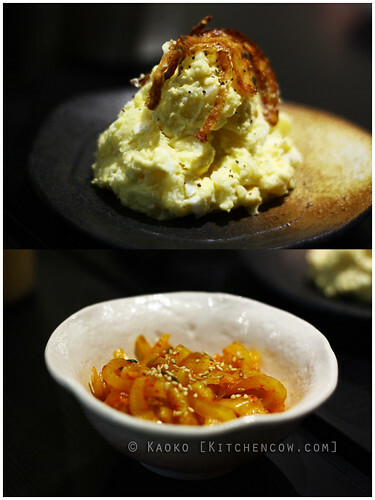 But I suggest still giving Kimukatsu a shot, because it offers a very satisfying dining experience. Drag your friends and family along, because this is one meal that’s meant to be shared and enjoyed. 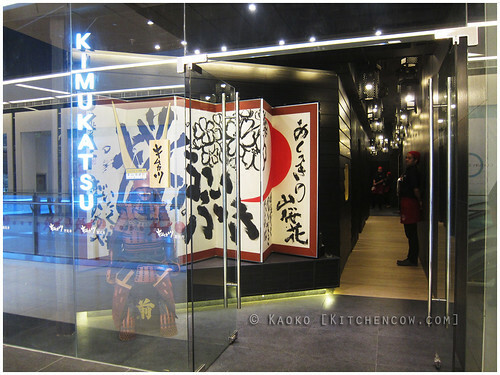 Kimukatsu has branches at Shangri-la Plaza Mall and Century City Mall. A branch is also opening soon at Bonifacio High Street. DISCLOSURE: Author was invited to sample Kimukatsu’s offerings. Text and photos are author’s own. No monetary compensation was received. I would love to try this out! And am glad they have a branch in Shangri-la! woohoo! Oooh! I think this definitely warrants a visit!